Over the last two years, and in response to recent pressures on the homelessness service system, Shelter, Support and Housing Administration (SSHA) has substantially increased service capacity and initiated key improvements to service quality and responsiveness. Over the past six months, significant outcomes have been achieved in improved operational responses to help meet the immediate needs of vulnerable people seeking emergency shelter. Despite these accomplishments, demand for services continues to rise, driven by extremely low rental vacancy rates, scarcity of affordable housing, and increasing numbers of refugee/asylum claimants in Toronto. SSHA is leading the City’s efforts and working with divisional partners to address ongoing pressures in the homelessness service system. The City continues to work with community partners and the federal and provincial governments to address ongoing and longer-term issues to ensure that residents of Toronto not only have safe emergency shelter but are also able to find and maintain a safe, suitable and secure place to call home. Investing $179 million in capital funding for acquiring and renovating sites to accommodate 1,000 new shelter beds. Up to 28 new shelter sites will be opened over three years (including four in 2018), which includes the 1,000 new beds in addition to 951 replacement beds. Increasing the City’s operating funding for shelters by $35 million by 2021. Investing $90 million in committed provincial funding to implement the Home for Good Program to assist about 2,000 vulnerable residents exit homelessness into housing with supports. An estimated 1,800 additional new units a year over the next ten years are needed to meet demand in Toronto as a permanent solution to homelessness. The number of shelter beds in Toronto remained relatively consistent for many years. Over the past two years, the City has added more than 2,000 shelter and motel beds to respond to growing demand. 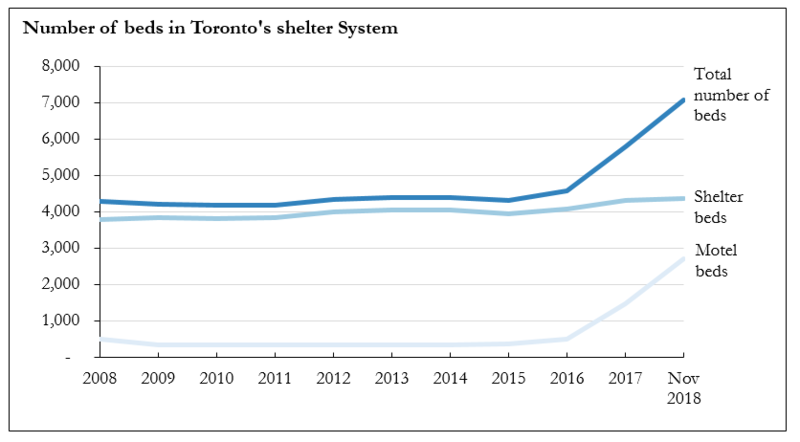 Currently, the City of Toronto’s shelter system has over 6,900 beds across 63 shelters, which includes 2,500 beds in motel rooms that are used to provide additional capacity. The City operates ten shelters directly. 24-hour Respite Sites provide essential services including a place to rest, meals, and service referrals for people who otherwise may not access a traditional shelter bed. As of November 2018, there are over 600 spaces at eight respite sites. The 2018/19 winter plan maintains at least 600 24-hour respite service spaces with more available as contingency space throughout the winter, 280 of which will be offered at three prefabricated structures. SSHA will monitor and evaluate service level requirements throughout the winter. Better understanding the individuals and families who are in need of emergency shelter is key to a flexible and responsive system. The Shelter Management Information System (SMIS) is the city-wide real-time homelessness management information system, which contains common client records and occupancy data. Efforts are underway to expand SMIS and increase capacity to track clients across a broader range of housing stability programs. In April, the City conducted its fourth Street Needs Assessment, a comprehensive survey of people experiencing homelessness in Toronto. Results will be reported in November 2018. Shelters and respite services are important to support people when they are in immediate crisis. However, the real solution to reducing and ending homelessness in the longer term is to continue to expand housing first approaches to increase prevention and housing stability. The City adopted a housing first approach in 2005 across all of its services, including the Streets to Homes program and the shelter system. Since 2016, the City has assisted over 15,000 individuals to move from shelters and the street to permanent housing including more than 2,000 people experiencing chronic homelessness. In 2017, City Council approved two reports that introduced new community engagement processes and new shelter planning and approval processes to reduce the challenges of securing properties for new shelters. In 2018, Council approved creating 1,000 new permanent shelter beds over three years as part of the City’s 10-year capital plan. The 2019 Shelter Infrastructure Plan was adopted in June 2018. As part of the new planning process, SSHA will bring forward an annual infrastructure plan to City Council for approval. SSHA’s Housing Stability Service Plan 2014-2019 was the first five-year service plan for the City, which outlined actions required to create an integrated client-centred and outcome-focused service system. A new five-year SSHA service plan will be developed to align with the strategic directions of the 2020-2030 Housing Opportunities Toronto Plan. This work will include engagement with City divisions and community partners.